Things are looking pretty good for the new Judge Dredd movie, as the character's creator praises everything from the set design to the script. The first attempt to bring Judge Dredd - the ultra-violent lawmen from the 200AD comics - to the big screen, back in 1995, was a critical and commercial flop. But the second attempt - simply titled, Dredd - seems to be hitting all the right notes, as it's got the stamp of approval from the original Judge Dredd writer, John Wagner. Following a visit to the Dredd set in South Africa, Wagner expressed admiration for the design of the Mega City One sets and said that the whole crew seemed really dedicated to making an excellent movie. He was impressed by the performances of Karl Urban and Olivia Thirlby - who play Judge Dredd and Dredd's telepathic partner, Judge Anderson, respectively - adding that Urban had managed to capture a lot of Dredd's mannerisms and looks from the comic, including his trademark scowl. Perhaps most importantly, he also gave the script his blessing. He said that he had originally disagreed with the direction that screenwriter Alex Garland - who also wrote 28 Days Later and helped write Enslaved: Journey to the West - had taken the story but had since come around to Garland's way of thinking. "Alex Garland and I have had our disagreements," he said. "But he has usually had a convincing argument for doing things his way. On the main issue, concentrating the plot on a slice of life rather than trying to convey the whole sweep of Dredd and Mega-City life, I now see that he's right. It was one of the flaws of the first movie, they tried to do too much." 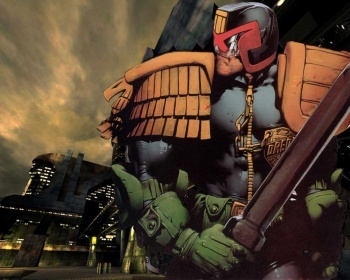 Dredd is expected to hit theaters around December this year.